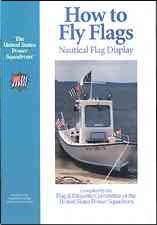 In 1998, USPS in consultation with the U.S. Coast Guard, Coast Guard Auxiliary, New York Yacht Club and other yachting authorities developed an updated nautical flag code, How to Fly Flags, Nautical flag Display for use on private vessels. The new nautical flag code is flexible enough to accommodate the wide variation in construction of modern pleasure craft. New configurations of boats, riggings and the like have slightly modified the traditional points of honor. Use of antennas, fishing towers, outriggers, sailboat backstays, portside halyards, and double hoisting are all new to the nautical flag code. The booklet is available from USPS Headquarters and various marine retailers around the country for around seven dollars. Ted Kaye, a member of the North American Vexillological (the study of flags) Association NAVA, has created a electronic document that can be viewed on-line, or downloaded and printed, that graphically demonstrates the differences between good flag design and bad flag design. The document uses actual flags to demonstrate the five basic principles that should be used in creating any new flag: 1. keep it simple; 2. use meaningful symbolism; 3. use 2-3 basic colors; 4. no lettering or seals; and 5. be distinctive or be related. While these principles apply to any type of flag (i.e., organization, city, tribe, company, family, neighborhood, or even country), USPS squadrons and districts contemplating new flag designs should review the document carefully because these principles are used by the Flag & Etiquette Committee when reviewing new flags. What is the proper way to fly flags on a gaff rigged pole?